One thing about eating Paleo is that you don’t have to give up meat, and in fact it plays an integral part in the plan. What you have to watch out for is recipes that seem like they’re Paleo friendly but in fact traditionally use ingredients that are not. For instance, at first glance meatballs seem like little balls of meat, but a traditional meatball recipe will include breadcrumbs and milk. These are two no-nos for caveman dieters, so it becomes necessary to find ways to make them without these unauthorized ingredients. Flavorful Italian paleo meatballs are browned and then set in the slow cooker to take on juicy, delicious flavor. The slow cooker takes care of the long simmering process that meatballs usually require. They can also be served as an appetizer if you make them shaped slightly smaller and serve them with a toothpick. Garnish with additional fresh parsley to finish the dish. 1. Heat one tablespoon of olive oil in a large skillet over medium heat. Add the onion and sauté for 4-5 minutes. Add the garlic and cook for one minute more. Remove from heat. Add half of the onion mixture to the slow cooker, and the other half to a bowl. 2. Add the diced tomatoes, tomato paste, oregano, and basil into the slow cooker and begin to cook on low heat while the meatballs are prepared. 3. In the bowl with the remaining onion mixture, add the ground beef, almond flour, eggs, salt, pepper, and parsley. Stir to combine. Use your hands to shape into meatballs. 4. Heat the remaining olive oil in the skillet over medium heat. Add the meatballs into the pan and cook just enough to brown on each side. Place the meatballs into the slow cooker, cover, and cook on low heat for 5 hours. Serve warm. 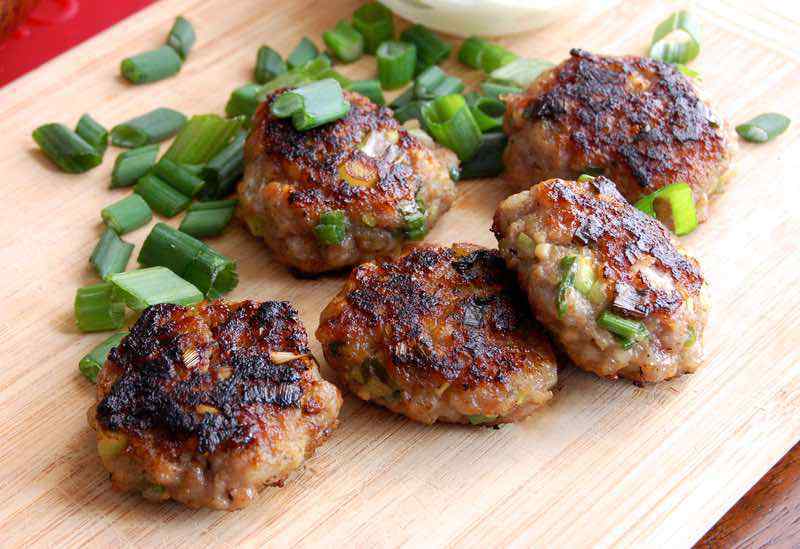 Green onions and lemongrass lend a Thai flavor to these easy paleo pork meatballs. Great as an appetizer or for a small meal, this recipe can easily be doubled. Serve with a spicy chili mayonnaise dipping sauce. 1. Heat the grill to medium heat. Mix all of the ingredients together in a large bowl and stir well. Using your hand, form 6-8 small patties or balls. Grill for 4-5 minutes on each side. Serve hot. These Asian meatballs more closely resemble the delicious meat found inside of potstickers. Carrots and green onions make their way into the recipe, as well as a hint of smoky sesame oil. Baking the meatballs is recommended, but pan-frying would also work. Drizzle with Paleo hoisin sauce to serve as an appetizer, or enjoy alongside slaw and cauliflower rice. 1. Preheat the oven to 375 degrees F. Line a baking sheet with aluminum foil and then place a wire cooling rack on top of the baking sheet. Coat the wire rack well with coconut oil spray. 2. In a large bowl, mix together all of the ingredients. Roll the mixture into small balls using your hands and place on the wire rack. Bake for 20-25 minutes until cooked through. This recipe is Paleo to the core, cutting out the grains and advising you to use grass fed beef for the meat. It’s also loaded up with vegetables that you’d find in any respectable garden, and has you covered with plenty of seasonings and herbs so that your taste buds are given a treat. If you were worried that following a Paleo lifestyle meant you had to eat boring or bland foods, don’t fret. 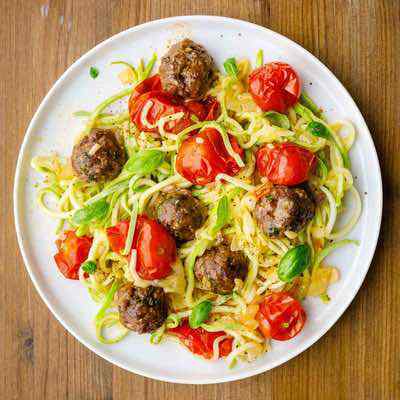 It has to be one of the tastier diets out there, and these meatballs are proof of that. This recipe also offers flexibility in the way of which veggies you can choose, which is nice for times when you want to use up what you have on hand before it goes bad. It’s really easy to make Paleo pesto because pesto is made with ingredients that are Paleo friendly, namely Extra Virgin Olive Oil and Basil. Throw in some pine nuts and this is definitely something cavemen could have eaten if they’d only had a food processor. They include a link to the recipe for the pesto, which you can make in bigger batches and use to add flavor to any of your meals where it makes sense. 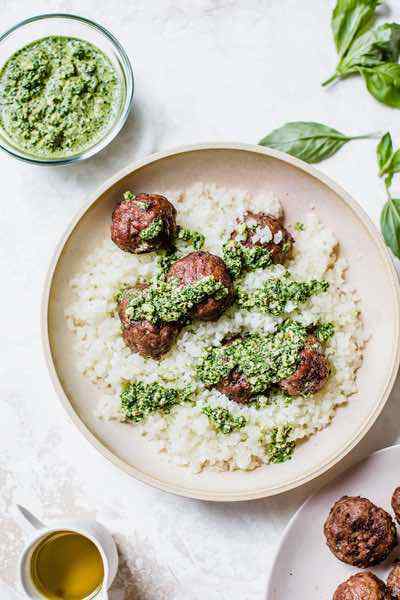 These pesto meatballs pack a lot of flavor, and when you combine them in the tomato sauce you’re getting plenty of nutrition and avoiding a lot of items that the body has trouble processing. Give them points for being brave enough to add fruit to meatballs, and for going exotic by using a tropical fruit like mango. It scores on originality, and is likely a combination that your palate is not used to. But hey, whatever works, right? And these definitely work, the sweetness of the mango and the savoriness of the ground turkey go together nicely. They use almond flour to get around the use of bread crumbs to hold it all together and keep it looking like a meatball should look. Fruit is a tertiary item in Paleo, so generally you don’t want to overdo it, but here it goes nicely. Chorizo may become your new best friend when eating Paleo. It’s a typically spicy sausage that will add a kick to whatever you use it in. Some may say that sausage isn’t exactly Paleo because of the processing involved, but as long as you’re buying premium meats it should be alright. The use of lime and cilantro means that you’re going to round out the flavor palate and make this a winner right from the start. And really that’s about all it takes to bring this to life in your own home. Keeping it simple is a tenet of Paleo-ism. If you like to heat things up then these chipotle meatballs will be right up your alley. First, you’re getting plenty of meaty goodness in the form of ground beef, but the ensemble of ingredients that are included in this really makes the difference. Onions, mushrooms, and of course chipotle peppers create a flavor sensation. A strawberry mixture makes it so you dull the flames a bit if it gets too spicy for you. It’s also a nice way to make this sweet and spicy, always a good duo. They’re serving it all over arugula, so you’re incorporating veggies in every bite. 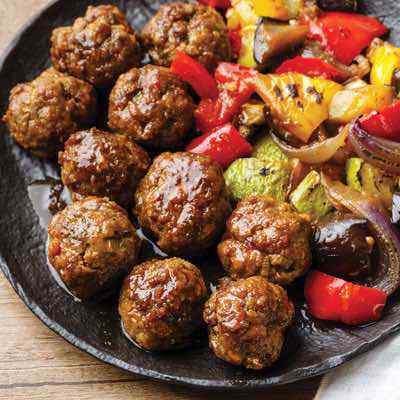 Both beef and pork are used in these meatballs, which might throw off some Paleo purists because it’s not as if a caveman would have kept on hunting if they already had killed one type of animal. But there had to be days when they were fortuitous enough to run into two kinds of animal, and it would have been a special day for them. Coconut flour gets the go ahead instead of bread crumbs, and goes right in line with the use of pineapple in these sweet and savory Paleo approved meatballs. It’s a bit short on vegetables, so you may want to consider a veggie side. 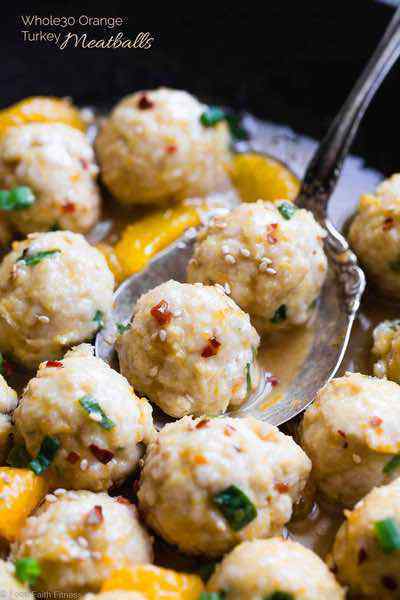 Following Paleo means grabbing delicious flavor combinations from all over the world, and these Vietnamese inspired meatballs have a hot chili sauce as well as a fish sauce to give them a unique flavor that you probably won’t be expecting from a meatball. There’s also a recipe for a slaw to serve these on that doesn’t use any mayo and doesn’t have any cream in it either. 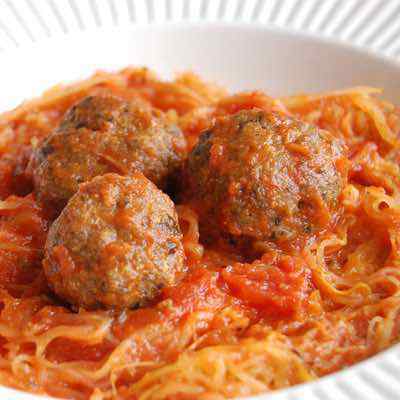 Just a nice mix of cabbage and carrots to eat along with all the pork the meatballs contain. It’s important to balance out the meat servings with a vegetable of some sort. These meatballs are like little mini chicken parms, and deliver the flavor that you’d expect from the full sized version. Yes, they’re using mozzarella cheese here, which will turn away some that don’t allow themselves any cheese while doing Paleo. Technically cheese is a no-no along with all other dairy products. You can easily make this more Paleo by simply leaving the cheese out, but you’ll be missing the full experience. There are vegan cheese substitutes that could be a good compromise if you want the chicken parm flavor without the dairy. These loaded nachos looked too good not to include on our list. Paleo guidelines say to nix anything dairy, and that would include the cheese and sour cream on these nachos. One workaround that we like is to head to the vegan section of the grocery store or health food store. There you’ll find suitable cheese and sour cream substitutes that won’t use any animal byproducts, so you’ll be in the clear. 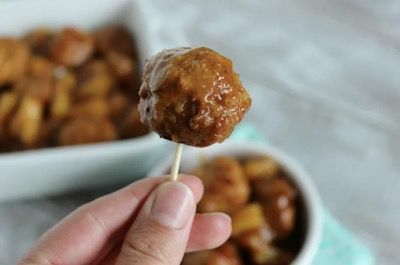 That way you can enjoy amazing meatballs like these without subjecting yourself to dairy. Or you can allow yourself to have meal or two a week that is not strictly Paleo. These caprese salad inspired meatballs are delicious no matter how you choose to serve them. You don’t even need to include the mozzarella if you want to opt out of the cheese. The mixture of herbs and the inclusion of basil and sun-dried tomatoes means that you’ll still have plenty to chew on in the flavor department. A traditional “insalata caprese” is layers of tomatoes, and mozzarella with basil providing massive flavor enhancement, so these live up to their title. Be sure to serve them with a vegetable, perhaps resting on a bed of baby spinach, as by themselves they are pretty meat-centric. These meatballs try to deliver the taste of a bacon cheeseburger in each bite. They have enough going on that if you want to take out the cheese, or use less they’ll still taste great while keeping more in line with what you should be eating. The important thing is not to treat Paleo like a traditional diet, where it’s a house of cards that can easily topple if you eat a meal that isn’t entirely made up of authorized foods. Listening to your body is key, and the occasional meal where you satisfy your cheeseburger craving without a bun might be what you need. One great thing about Paleo is that you can partake in many Mexican themed meals by simply cutting out the flour tortillas. Here they’ve captured the essence of enchiladas and infused it into a meatball. It’s easy enough to leave out the queso fresco, aka fresh cheese, and keep this 100% dairy free. Or you can allow yourself to have it since it is not used in large amounts and really completes the flavor profile. With all of the seasonings in play here you won’t be left feel short changed, and there’s even salsa verde to deliver delicious Mexican flavor. If General Tso’s chicken was your standard go-to when ordering Chinese, you’re probably missing it since going Paleo because it’s just not possible to eat it because of the breading used. 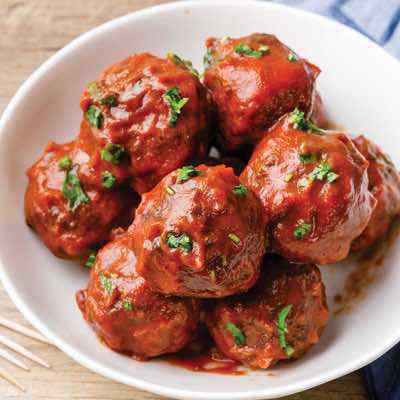 These meatballs have you covered, and will quickly find a place on your regular lineup because they deliver on the taste, and use coconut flour for the breading, so you’re in the clear. The sauce stays true to the flavors you want, right down to the orange by using the zest and juice of an orange, so no artificial flavors here, and no worries about MSG since you get to be quality control manager. 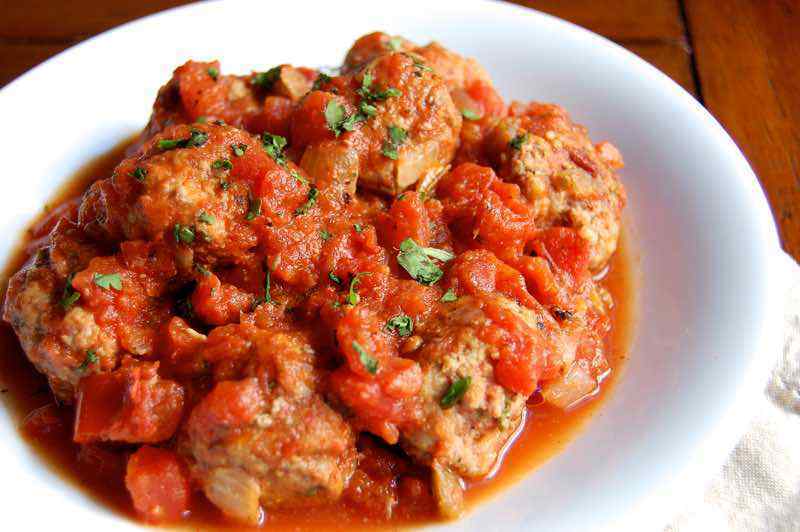 No Paleo meatball list would be complete without a classically Italian option. Here are some meatballs that will bring you back the the Old Country without the need of a plane ticket. Like any good Paleo recipe they have kept things stupidly simple as far as ingredients go. Meat, onion, parmesan cheese, herbs and spices. Totally easy, yet totally delish. They’ve scraped the bread crumbs of course, and point out that they were only ever used to make the dish more filling and to serve more people with the same amount of meat. This was originally created as a St. Patty’s day recipe because these come out looking green, and would go nicely with some green beer. Unfortunately beer is not authorized on Paleo, but you can still steal this green meatball recipe since it contains a fair amount of spinach to go with the ground turkey, rounding things out nicely for a Paleo eater. These are so basic that they only include 6 ingredients, and two of those are listed in the title. Rounding things out are an egg, garlic powder, salt, and cumin. Easy peasy, and totally yum. Best part is they’re baked so you can pop them in the oven and 20 minutes later you are go for consumption. 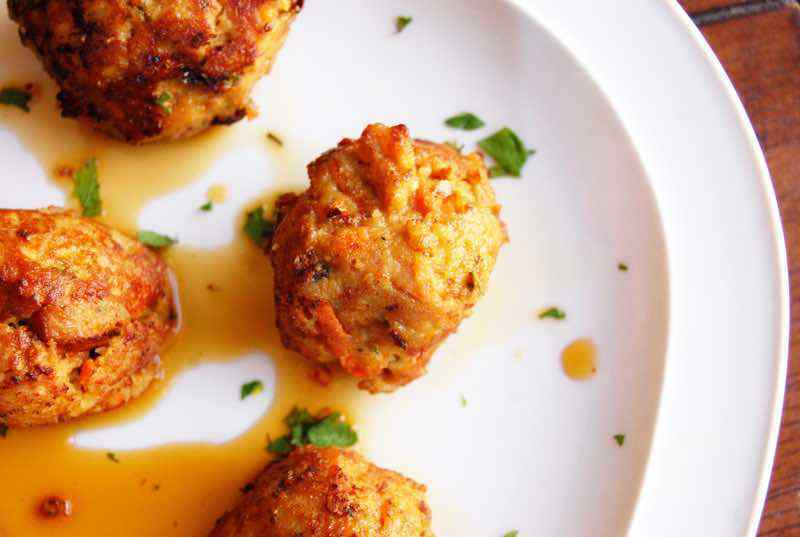 These are some gourmet style meatballs, and you simply can’t beat the flavor combination of sun-dried tomatoes and feta cheese. Traditional feta cheese is made with sheep’s milk, which opens the discussion of whether dairy is avoided on Paleo because of all the junk that is pumped into conventional cows which makes its way into conventional dairy products. You’ll have to come to your own conclusions as to what you’ll allow and avoid when following your Paleo path. These meatballs are definitely worth trying if you decide to give feta cheese the green light. 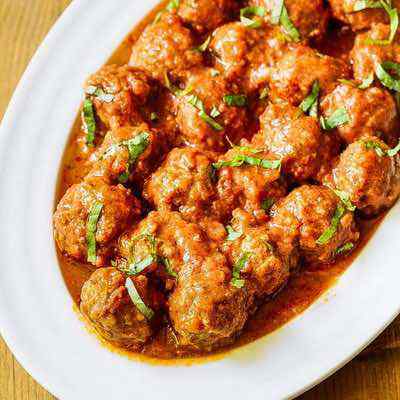 These meatballs borrow from India in regards to the seasonings being used, namely garam masala, which means “hot spices” so these will get your mouth watering. They include a recipe for a garlic cream dipping sauce, and this uses Greek yogurt, which your body may or may not tolerate well. If you know for a fact that you don’t do well with it, simply skip the sauce and eat them straight up. Greek yogurt is not any more or less Paleo than regular yogurt, it simply goes through another step and has the whey strained from it. It’s still made from cow’s milk, and has the same drawbacks of all dairy products. 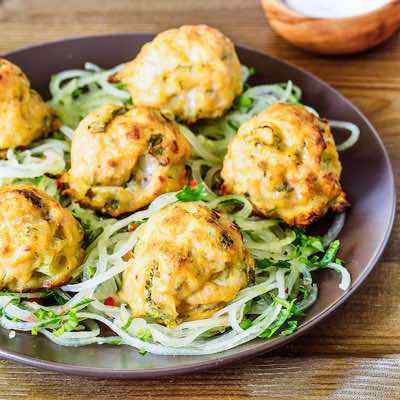 Thailand is the inspiration on these meatballs, and they’ve made them mini so they’re even easier to eat. Red curry paste is what provides the Thai flavor, and red curry is a dish that is enjoyed throughout all parts of the country. Almond flour fills in for the bread crumbs, and they even go so far as the use Thai basil for a truly authentic recipe. The base of these meatballs is grass fed beef, so they’re having you use a quality meat from cows that were not fed grains, and it should be free of antibiotics as well. The ingredients in this are simple and can be found either online or at your local grocery store. 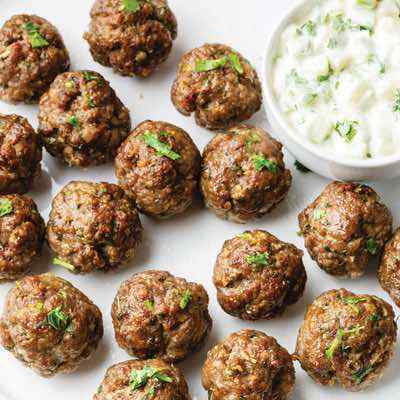 If you’re a fan of kofte kebabs you’ll love these lamb meatballs because they bring that same flavor without the need of a skewer. They even get it right with the inclusion of mint leaves so you have all of those seasonings plus that distinctive mint flavor that typically comes with these. They recommend serving this alongside a Greek salad which is a great idea and sticks to the theme. There is also a recipe for a tahini infused dipping sauce, but you may want to avoid this as it contains dairy in the form of Greek yogurt. They suggest a squeeze of lemon as an alternative. We just had to find out how these got the nickname fireball. The ball part was easy because that’s what form they come in, but we soon discovered that it’s the collision of jalapeno and cayenne pepper that brings the heat. 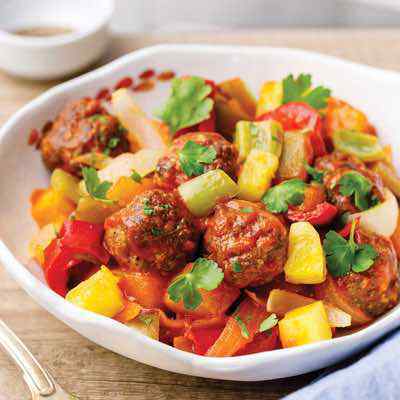 Pineapple does a good job of keeping this grounded with a bit of sweetness, and coconut lends its familiar flavor to these island inspired meatballs. Pork gets the call as the meat being used to keep them meaty. We’re suckers for Paleo recipes that are made Florentine because that means there will be hefty amounts of spinach in them, which means we’re getting topped up on our vegetables at the same time we’ve got a mouthful of meatiness. They have these sitting on top a pile of spaghetti squash, so it’s doing a great job of bringing a popular dish of spaghetti and meatballs, but making it so no wheat gets harmed in the process. You flat out can’t beat the ingredients used on this as far as flavor and Paleo-readiness goes. Coconut and curry go together like peas and carrots, the coconut giving a sweet and delicate flavor, and the curry giving it some spice and robustness. The step by step visual walkthrough makes these caveman easy to follow, and the use of both curry powder and garam masala mean that the aroma of curry is going to permeate your house. 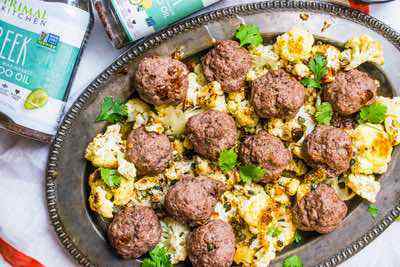 This is one of the better curry meatball recipes we’ve seen, Paleo or otherwise, and it’s using both a beef and lamb to get the job done. These are made to Whole30 standards, so you know you’re covered. Whole30 starts with Paleo as a base and then makes further exclusions based on the most recent studies on how foods affect the human body. That means you can get both your spicy buffalo fix, as well as your ranch fix handled without having to worry about ruining your progress with an off meal. They remind you to check the ingredients on the buffalo sauce you use to make sure that it’s not sneaking additives that simply don’t belong in it. 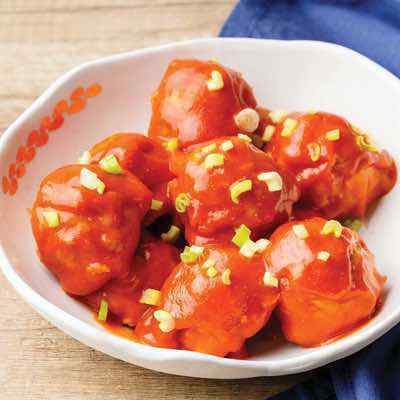 This is a great way to get the boneless buffalo wing experience without having to worry how they make them. These are some pretty classic meatballs, using both lamb and beef gives them a more complex flavor than just one meat alone. The tomato sauce that accompanies them is a mixture of simplicity and traditional ingredients that really ties together the offering. Make sure to include a generous serving of vegetables, perhaps a big salad to go with it because aside from the tomato and onion in the sauce there isn’t much in the way of vegetables in the actual meatballs. Contrary to popular misconception Paleo is all about finding a balance between meat and veggies with some fruit and healthy fats, not just eating the equivalent of a brontosaurus. Raspberries provide their unique combination of sweet and tart, and chipotle brings its notorious heat that spices things up but not to the point where it hurts. That’s what makes these meatballs something special, and this recipe one you’ll turn to as frequently as you’d like. The use of both ground pork and bacon means that there’s a lot of pig products, and they work together with garlic and fennel seeds in a truly inspired Paleo friendly dish. These don’t use much in the way of vegetables so be sure to eat a leafy green salad for fiber and nutrients. 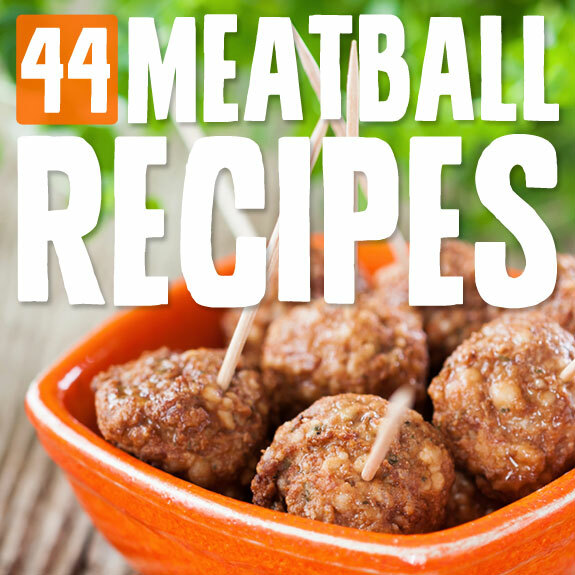 How to make a meatball even more delicious while keeping it Paleo? Wrap it in bacon! Here’s a creation that will have you salivating as you put it together. Grass-fed ground beef makes up most of the meatball, and they’ve managed to squeeze onion and mushrooms into this as well. There is also a recipe for pesto included, and all of the ingredients stick to the Paleo regimen. What you end up with is a pesto-topped, bacon-wrapped meatballs that present well enough to serve at a party. 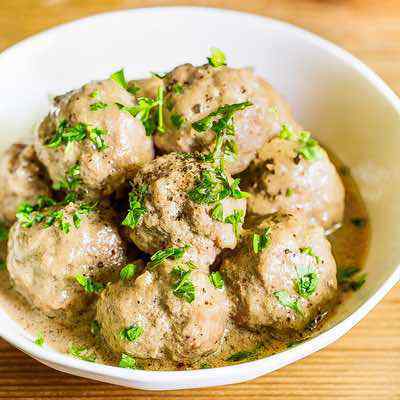 Swedish meatballs are one of the most classic meatballs, and if you’d like yours without the use of horsemeat this is the way to go. They’ve made these gluten free by subbing out the traditional bread or bread crumbs with almond flour and white rice flour. When you eat Paleo you are automatically going to be following a gluten-free diet because you’re getting rid of all grains entirely, including wheat, which is where gluten is found. 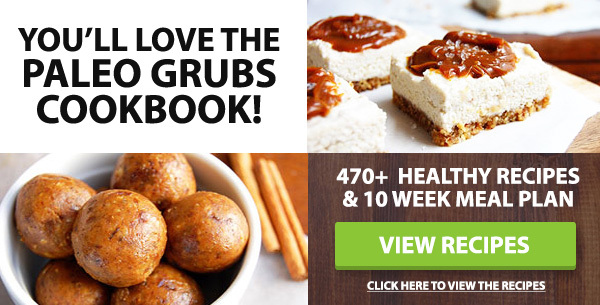 Here you’re getting a classic recipe made according to Paleo standards so you can enjoy it without the bloated heavy feeling afterward. We’re pretty sure that Stone Age man was not enjoying an after dinner bourbon, but that’s OK. Alcohol is not a Paleo approved item, but none of it will remain after these are done cooking, so you can enjoy the flavor that’s left over without breaking from the plan. 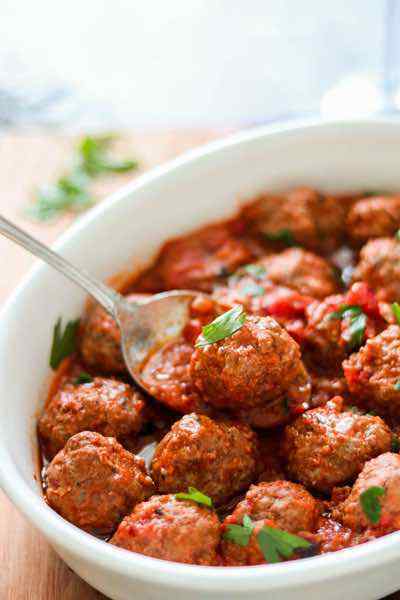 The meatballs themselves are pretty standard, a mix of ground turkey and spices and seasonings. It’s the glaze that gets all the attention, and for good reason. That’s where the bourbon is and it’s mixed with cider and rosemary for a very eclectic taste that is not typical with most meatballs out there. If you love Moroccan food you’re in luck because there are plenty of Moroccan foods that you can fully enjoy while you are doing Paleo. The unique blend of ingredients is specific to the Moroccan region, and here we see paprika and cumin used in both the meatballs and the sauce that goes with them. Lamb is getting the nod for the meat, and if you’ve ever had Moroccan lamb shanks you’ll know that lamb goes great with Moroccan seasonings. These don’t have any vegetables in them, so be sure to have a salad with it, perhaps a Moroccan themed salad to make it a fully Moroccan meal. Scotch eggs are like meatballs with a hardboiled egg on the inside, all of which should have a Paleo dieters saliva glands working overtime. They are using turkey mince meat to wrap around the hard boiled eggs. As you might have guessed you boil the eggs before wrapping them up and cooking the outer meat. This is great for prep time because while the eggs are boiling you can be getting the rest of the ingredients ready. They recommend using ground almonds or coconut flour as a workaround for the standard bread crumb coating. Next articleMedical News Today: Is high blood pressure always bad? Medical News Today: Could stem cells reverse diabetes?